The lost and found area of the Star Wars Launch Bay is home to a wealth of stories, some canon, some now belonging to galaxy of Legends, and some that even pull back the curtain on the creation process. Take, for instance, this white Z-6 jetpack. One could be forgiven for thinking that this is the jetpack used by the Stormtroopers during one of the opening scene scenarios in Star Tours: The Adventure Continues, but that wouldn’t be the case. And as with everything Star Wars the more you shift through the lore the more interesting a single artifact can become. Let’s start our conversation with those Stormtroopers. In the Ambush at Star Tours four action figure set, they are listed as Sky Troopers. However, Skytroopers have existed previously in the Star Wars Universe, specifically as a model of battle droid utilized during in Star Wars: The Old Republic as replacement soldiers for the Eternal Empire. We’ll stop there and let you uncover more about The Old Republic for yourself. The Imperial version of Stormtroopers with jetpacks are more commonly known as Jumptroopers, but have been known to call themselves Skytroopers or Air Assault Troopers from time to time. So could this be their jet pack? Not likely, the equipment these Jumptroopers were typically furnished with was either the AJP-400 Hush-About jetpacks or a JT-12 jetpack. These dead ends leave us with the man most of us are familiar with for his use of a jetpack, Boba Fett. I can hear you now, Boba Fett’s armor isn’t white you nincompoop! And you’d be right, but this is when we start to peer behind the screen as it were. In original designs for Empire Strikes Back, Boba Fett wasn’t necessarily the baddest bounty hunter in the galaxy, he was actually going to be a type of Stormtrooper known as a Supertrooper. The pure white armor was conceived around this concept by Joe Johnston and Ralph McQuarrie, but the jetpack utilized in their concept art was drastically different than what we know today. Production moved on and Boba Fett became his own character and not a tool of the Empire. When test footage was shot for the character in 1978, the armor was white, but only because they hadn’t taken the time to apply color to the armor. In fact, the character was in such a state of flux at this point that Boba Fett hadn’t yet received his cape. Instead, for the test footage, production crew utilized what they had readily available, a Star Wars towel. Back to the jetpack at hand, the Z-6 jetpack was a favorite of Mandalorian commandos, with specific examples being utilized by Boba Fett and his father, Jango, as well as members of Death Watch like Bo-Katan Kryze. While the coloring of armor can mean everything from duty to mourning the loss of a loved one, there is no official standing for white Mandalorian armor. 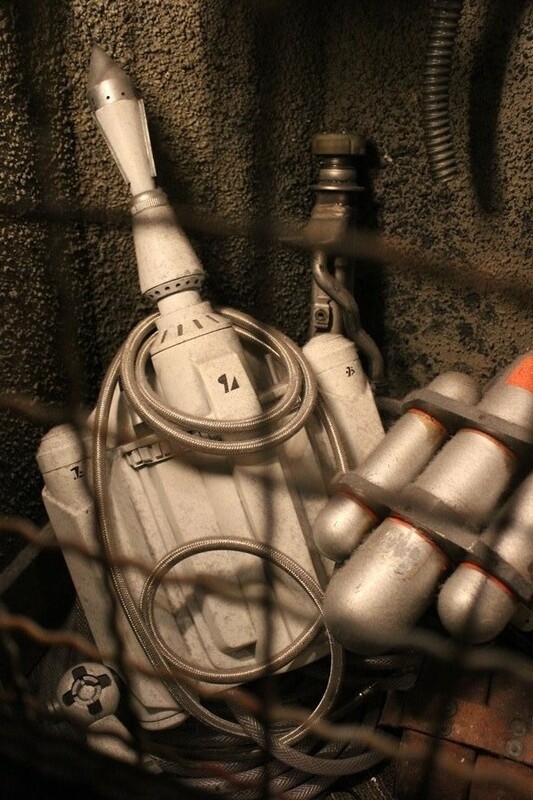 None of this gives a definitive answer to who this Z-6 jetpack belongs to in the Star Wars Launch Bay Lost and Found. It could be any number of Mandalorian Commandos, a member of Death Watch perhaps, or something from Boba Fett’s personal collection. Personally, my belief is that this is a nod to the Lord of the Bounty Hunters and the process by which he was created by the folks at Lucasfilm.